This tiny orchid (greatly enlarged) is about the size of an adult's little fingernail. Besides the pink lady's-slippers of May, two other wild orchids grow in Westborough's woods. 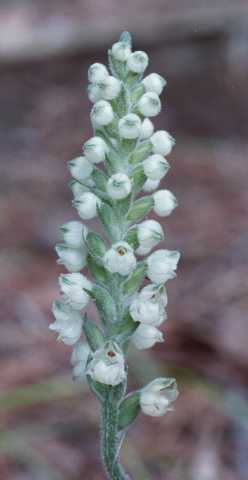 One of these native orchids, called downy rattlesnake-plantain, blooms in early August. At this time of year, downy rattlesnake-plantain (Goodyera pubescens) puts up 12- to 18-inch stalks that bear tiny white slipper-shaped flowers. "Tiny" means that each intricate blossom is as small as an adult's little fingernail. The blossoms are definitely worth a close look, perhaps even with a magnifying glass. This orchid is named for the distinctive white checkerboard pattern on its dark green leaves, which lie flat on the ground. The rattlesnake-patterned leaves are evergreen, making it possible to spot the plant year-round. The flower stalks, with their woolly or "downy" look, are noticeable at this time of summer. In centuries past, people had the idea that a plant's appearance was a cue to its possible uses. Accordingly, the rattlesnake-patterned leaves inspired the notion of using this plant as a remedy for snakebite. A tea made from the downy rattlesnake-plantain root was used for this purpose, first by Native Americans and then by European settlers. Look for small patches of downy rattlesnake-plantain along trails in wooded areas. You can find it on the steep hillsides around Sandra Pond at the Bowman Street Conservation Area, especially next to the trails approaching the foot bridge to the island. On the Charm Bracelet trail in the Headwaters Conservation Area, check the trailside just beyond the boardwalk on the Assabet Trail, on your right as you head away from the Assabet River toward Osprey Point. Along the Charm Bracelet trail in the Crane Swamp area on the north side of town, downy rattlesnake-plantain grows in places along the wooded trail between the Little Chauncy Pond parking area and the old cattle underpass under Lyman Street. A few flowers at the bottom of this plant's downy-looking spike (enlarged) have just opened. As time goes on, more flowers will open further up the spike. The checkerboard pattern on the small evergreen leaves gives downy rattlesnake-plantain its name. If you find downy rattlesnake-plantain, notice that its blossoms do not all open at once. Like many flowers that grow on spikes, the blossoms at the bottom of each spike open first. Blossoms higher up the spike open later as time goes on. When small flying insects—such as tiny wasps—visit the flowers, they tend to start at the bottom of a spike and work their way up. Then they fly to another spike and start again at the bottom. Each downy rattlesnake-plantain flower has both male and female parts, but they mature at different times. 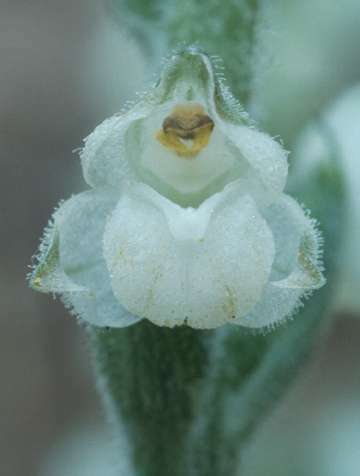 In effect, each flower is first male, then female. The male flower parts mature early, producing sticky, brightly colored pollen. The female parts mature later, becoming ready to receive pollen after the flower's own pollen has been collected. In the grand scheme of things, the insects' habit of crawling up flower spikes and the timing of the flower parts' maturation work together to bring about cross-pollination. Pollen sticks to an insect that visits the newest flowers at the top of a spike and then rubs off on the older female flowers at the bottom of the next spike that the insect visits. The genetic mixing from cross-pollination is healthy for the next generation of plants. 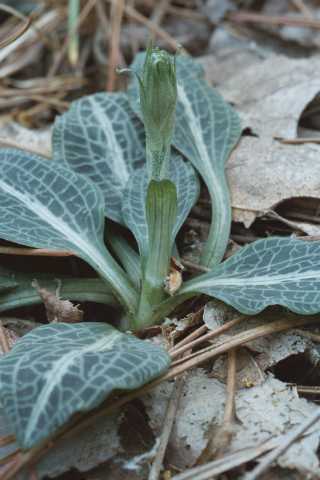 In the past, downy rattlesnake-plantain had other uses besides treating snakebite. People also put mashed leaves on burns and skin ulcers. Native Americans made tea from the leaves for colds, toothaches, and kidney troubles.